But rather than presenting all the instances when one might alter a photograph and arguing that there are times when it's acceptable to touch up a photo without misrepresenting the historical record, I thought that in honor of Israel Independence day I would focus on one artist who alters photos to create beautiful art that pays tribute to Israel's cosmopolitan city of Tel Aviv. Israeli artist Ron Shoshani produces images of Tel Aviv and other contemporary scenes from Israel using the latest technology. Producing such photographs in the past with the use of high-end filters and processing was too expensive, he says. Today, Shoshani is able to create digital photo manipulations in just minutes by applying different post-production filters to his images. After shooting between 500-700 photographs at each location with an array of different angles, Shoshani then experiments with different lighting and filtering effects that can be applied to all the photographs through batch filer processing. A technique that once took days now only takes him a couple hours. The artist developed a unique process that consists of a mix of stand alone digital manipulation tools, commercial digital retouch applications and layered textures that have created a unique "signature" of his works that is being recognized around the world. 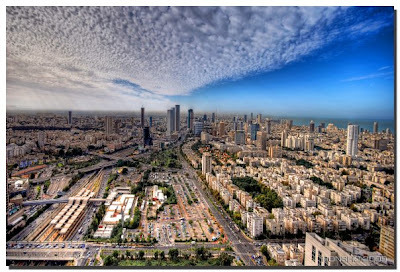 When I asked Shoshani why he chose Tel Aviv as the subject of most of his photography he gave me two answers. First, he explained, "My family, as pioneers, came to Tel Aviv around 100 years ago and established their life and business in the city. I was born and raised in Tel Aviv as well, and although I was traveling around the world a lot, as a Jew, Tel Aviv is where my heart is. I love the city... this is the 'Big Apple' of every Jewish person." He also has chosen Tel-Aviv as the main focus of his photography as an effort to create iconic photos of the city and to present Tel Aviv like every other international, modern and cosmopolitan city. Known on the Web as "Ronsho," Shoshani's photo collection has been receiving much attention. His photos are displayed and available for sale throughout the Web at such sites as Flickr and Red Bubble. 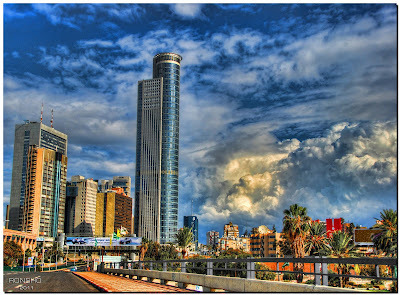 He's frequently asked to have his photos represent Israel in the media and Time Out Tel Aviv magazine used one of his Tel Aviv skyline photos for its cover story about Tel Aviv. He explains, "When people see the city the way it was presented on the cover of a magazine, it's a perception change. It contradicts the regular daily news in which they've been hearing about Israel. It makes people think 'I wanna' be there. I didn't know that Israel looked like this.' With this in mind, the strong power of a visual is being translated into a different mindset." So, this week when so many are chastising a newspaper for altering a photo in a negative way, let's recognize Ron Shoshani who is altering photos with artistic talent to represent Israel in the best light (and filter). Happy 63rd year of independence to Israel!